When we refer to “verticals” we mean any organization in a common business platform with a large quantity of properties in their portfolio. Some examples of verticals are banking, healthcare, retail, telecommunications, shipping (e.g. FedEx, UPS, US Postal Service), and many others. Most verticals have some unique metrics that make comparing them to more general building types (e.g., offices) less meaningful. From a facilities manager’s perspective, each vertical often has special considerations, whether they be for the energy consumption, special maintenance or cleaning needs, special security needs, etc. By comparing buildings that relate to the vertical of your building, your benchmarking results will be more accurate. After you do the initial benchmarking to identify the areas of your facility that have ample room to improve (based on the cost numbers when compared to other similar facilities), you will be ready to see how you can improve your facility performance. You will do this by benchmarking best practices — but only for the building in your vertical that are similar. So, by being able to benchmark verticals, you should have much more confidence that your results will be meaningful and lead to success. In our work with verticals there are some frequently listed or identified reasons for participating in the benchmarking process. Shifting production or resources to more efficient sites. Promoting Facilities Managers who are managing high preforming facilities. The participants probably know each other’s facilities. A common cost reporting system. 1st quartile. Explain and justify that further costs reductions can only be obtained by degrading either services to the occupants or reducing the service life of the facility. If you are in this area then you really can use benchmarking to mitigate some of the pressure to reduce costs. 2nd or 3rd quartile. Your costs could be better and you should begin working with your peers that are in the 1st quartile to improve your operating performance. 4th quartile. It is good to know where you stand and the great opportunity to improve the performance of your facilities. Maybe they have been underfunded in the past and are in terrible shape. You just need to start working with the peers that are performing at a lower cost and set firm, but achievable objectives. Benchmarking as a “change agent.” Many verticals struggle to make organizational changes across the entire organization. By definition, a Vertical is large and there are many impediments to change. Benchmarking can provide cost comparisons that are hard to hide behind and help justify changes that improve operating efficiencies. The benefits to benchmarking certainly outweigh the negatives. Here is a suggested approach to help you to get started. We have used examples from FM BENCHMARKING to illustrate how easy the process should be and this approach will allow you obtain the key output reports in the minimum amount of time. First of all, benchmarking can be an intensive effort so focus on what is important! For verticals, what is important are the services included in your scope of work. A quick review of your budget will show that energy and utilities, maintenance, janitorial services, and security usually represent the largest share of your operating expenses. That is why we focused these first three articles on the top cost areas. These four components typically represent, for most facilities, between 95 and 97 percent of their controllable operating expenses. The largest or second largest expense of these four is almost always maintenance (utilities are the other). If maintenance hasn’t been carefully benchmarked in the past year or so, it is also one with the highest potential for savings. Maintenance is nearly always normalized on a cost per area basis and a cost per occupant basis. In this example we will work with the vertical of a financial services organization to compare its cost per area basis. It is also important to compare the normalized maintenance costs with a relevant peer group. 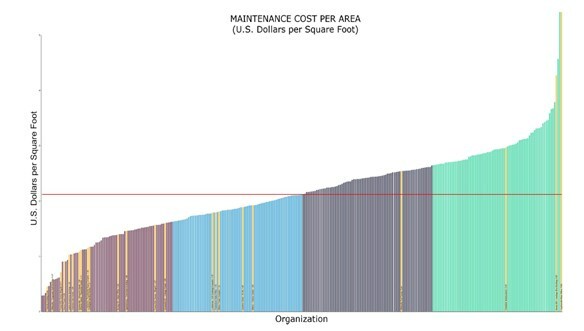 Figure 1 is a chart showing the maintenance costs using the filter criteria listed below; the yellow lines represent your facilities; the other lines are buildings external to your organization. This allows you to see at a glance how your facilities compare with other financial services facilities. There are 322 buildings in this peer group with a median utility cost per square foot of $2.18 and a first quartile performance of $1.78 per square foot. Note that most of the yellow-bar facilities are in the first and second quartile, but there are two facilities in the third quartile with three facilities in the fourth quartile. The highest cost facilities at the far right of the fourth quartile are really worth looking at. Prior to the benchmarking program the management team thought they were doing “just fine.” This is just one example of the power of benchmarking to produce organizational changes. To reach second quartile, or move the high cost facilities into the third quartile you could begin looking at the best practices and the implementation rates. In this example we ran the implemented best practices for the highest cost facility, the one at the far right of the chart, to see what they had done. Figure 2 shows no implementation in the subject building for any of the first five best practices. It also shows the implementation rate for the 4th quartile and 3rd quartile groups. This is only a partial list from FM BENCHMARKING, there are about 30 best maintenance practices overall. After reviewing just this data we concluded that it should not be too difficult to radically improve the performance of the high cost buildings. Using the results from this table, the facilities group can make proven recommendations for maintenance services that would help achieve significantly improved performance or move toward first quartile performance. Again, this is win-win for the entire organization. The company will achieve cost savings from the maintenance improvements and improved levels of service; the FM will improve their profitability by more effectively utilizing their workforce, and there will be improved occupant satisfaction which benefits everyone.